The Write Question is a weekly video podcast all about writing. 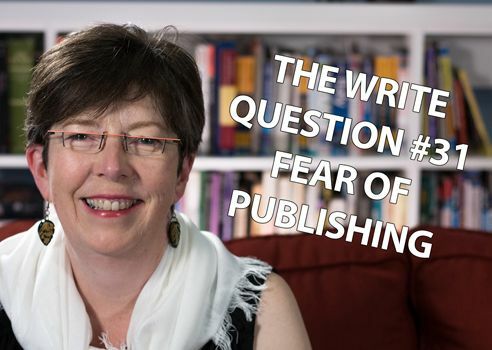 Today’s question focuses on the fear of publishing. Welcome to The Write Question, I’m Daphne Gray-Grant. Today we’re talking about fear of publishing. Today I’m answering a question from Aurore Lafougere in Paris. Here’s the question she emailed me. I was a blogger for eight years and wrote more than 1,000 posts and had more than 3,500 comments. But now, I find it impossible to publish. This is much more than perfectionism. Instead, I wrestle with comments like ” The Internet is already crowded with stuff like this,” or “What if people don’t like it?”, or, “this post will fill servers in the world and I have to think about the planet.” I seem to have lost my voice and my capacity to take action when it comes to publication. Do you have any advice for this strange symptom? Thanks for the question, Aurore. All writers come up with excuses for not writing. Although I must admit, a concern for ecological reasons is a new one to me. I think you’re right that this is not perfectionism. Instead, it sounds to me as though you might be a little burned out. When I had a stroke more than 10 years ago, I experienced something similar. Since I was in my early 20s, I’ve read at least a book a week. But while recovering from this stroke I was unable to read for about a year. This was not a choice, but it was my body’s way of expressing its need for total rest. Being unable to publish may, in fact, not be the problem, but rather a symptom. Just like our brains need time to recover from a physical illness, they also need time to get over stress and burn-out. If you’ve been working too hard for too long, then take a break from writing. If you aren’t publishing now, there’s nothing stopping you from taking time off. So, remove the pressure to publish for at least six weeks. In fact, go mark it in your calendar and let yourself know that you’re not ALLOWED to publish during this time. But be sure to be very gentle with yourself. Give yourself lots of opportunities to do things that are fun. Really ENJOY your time off. Then, when you get back to writing ease yourself back in gradually. Remind yourself that the world will not end when you hit the publish button. Below, I provide a link to a blog post I’ve written on that topic. Yes, there is already lots of material on the Internet but there is only one you. Your views matter. Remember that no one is going to be forced to read what you’ve written. Reading is always voluntary. If people don’t like your writing — which I think is unlikely, — then understand that they don’t have to read it. That’s their decision, not yours. None of us have any control over what other people do, so it’s pointless for us to worry about it. Writing demands an incredible attention to detail. And it’s easy to become stuck in the minutia. Stepping back from writing and publishing for a time not only gives you a break, but it also gives you perspective. Thanks for your question, Aurore. I hope you are able to gain strength from this experience.